Visitors to Washington, DC’s famed, cherry-tree-lined Tidal Basin have even more options for celebrating those spectacular blossoms in 2018. 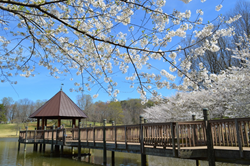 Nearby Fairfax County, Virginia will host a number of official events during this year’s National Cherry Blossom Festival®, as well as other cherry blossom-themed exhibits, self-guided garden tours, and activities celebrating Japanese culture and heritage. Peak bloom dates are expected March 17 – 20, 2018. For up-to-date information, visit http://www.fxva.com/cherryblossom. During the Festival, visitors are encouraged to check in at the main desk at each garden to receive a special complimentary memento and information on other National Cherry Blossom Festival® events. Check garden website for hours and directions. Japanese garden design is an art form millennia in the making. Stone, gravel, water, bridges, paths and plants all hold significance. Whether you are looking to make your own Japanese style garden or simply want to learn to appreciate the elemental meanings, Horticulturist Bevan Shimizu will teach you the essentials in creating a Japanese style garden. This program is from 9:30 – 11am. $22/person. Registration code: 290 285 7201. Design your own cherry blossom petal, flower, or tree to truly remember 2018’s Cherry Blossom Festival! Visitors will create their own unique representation of a cherry blossom. By growing their own crystals, guests explore the world of chemical reactions and solubility and become chemists! This Lab is open from 10am – 6pm. Activity included in price of admission to Lab. Lab located inside Fair Oaks Mall. Celebrate the blooming of the cherry trees and Japanese culture with Asian sumi-e brush painting for kids and parents. Learn about the materials and brush strokes used in this beautiful art style and take home your own brush painting masterpiece. The program is from 1 – 2:30pm and is designed for ages 5 to adult. $10/person. Registration code: 290 289 9201. See an artistic celebration of the Cherry Blossom Festival in every building of the Workhouse Arts Center campus during the evening Second Saturday Art Walk, including Cherry Blossom Art demonstrations for all ages, gallery receptions, and studio talks. Arrive before sunset to stroll the property and see our own cherry trees along Rt. 123. Buildings and history museum open at noon. Find Cherry Blossom custom jewelry, ceramics, glass and other visual arts. Talk to our artists about what inspires them. The Art Walk runs from 6 – 9pm. Admission is always free.